This past weekend was windy, no sun (it only peeked out a little finally Monday afternoon), and cold. I am not sure either day hit 60 degrees. I know my auction sale and garage sale days are numbered. My boys hit open pheasant hunting weekend, so my Mom and I hit a couple of garage sales and an auction sale on Saturday. The auction sales around here are estate auctions held outside the homes of those either who have passed or have moved to a retirement center. So to keep warm I wore long johns with a long sleeve shirt, two sweatshirts and a winter coat. Yep, a little crazy. 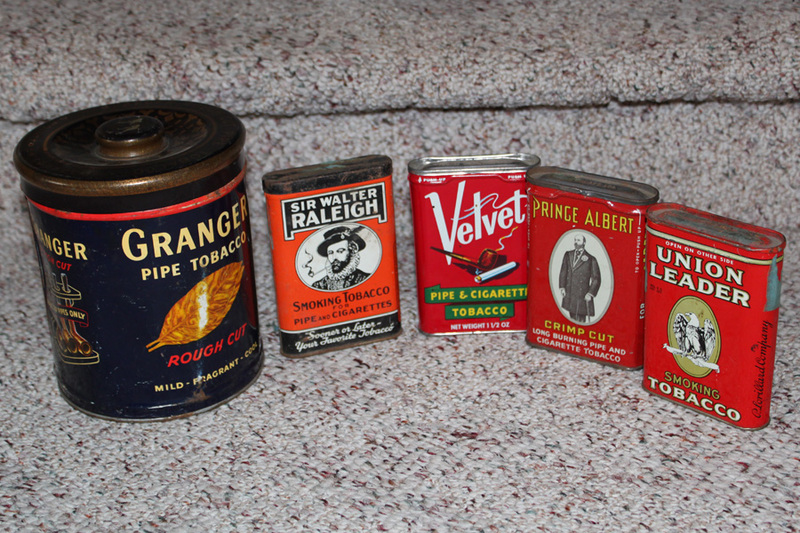 The first photo is of some tobacco tins I came across at garage sale. I do not smoke and am actually allergic to it so it bothers me. However, I love the old graphics on these cans. 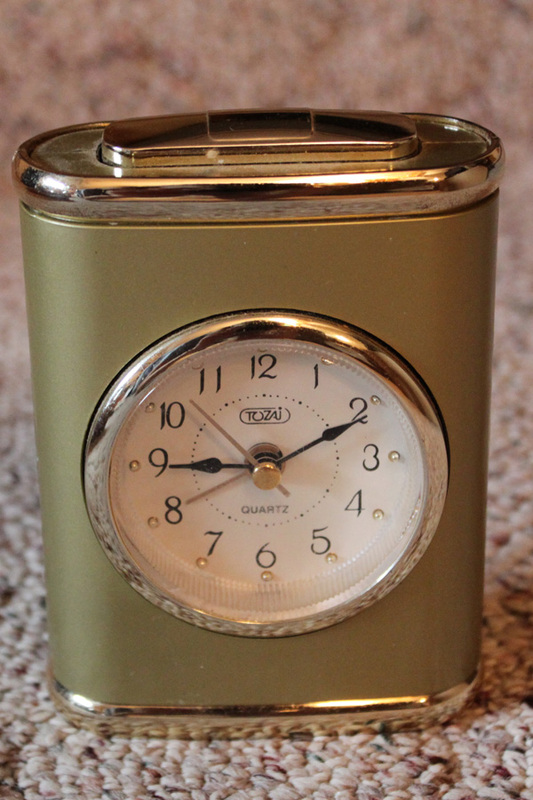 I loved the shape of this old alarm clock. However it doesn’t work, so I will probably take it apart to use the face for a craft. I saw this 8×8 cake pan at a garage sale. 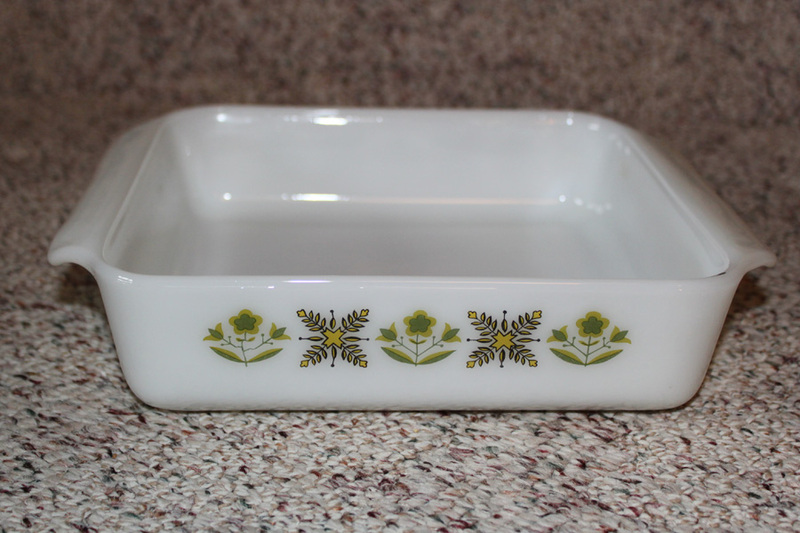 I had never seen this pattern on an Anchor Hocking Fire King dish before. It is called Heritage, I believe. It actually makes me think of Christmas. Can we really only have 10 weeks before Christmas? Say it isn’t so. 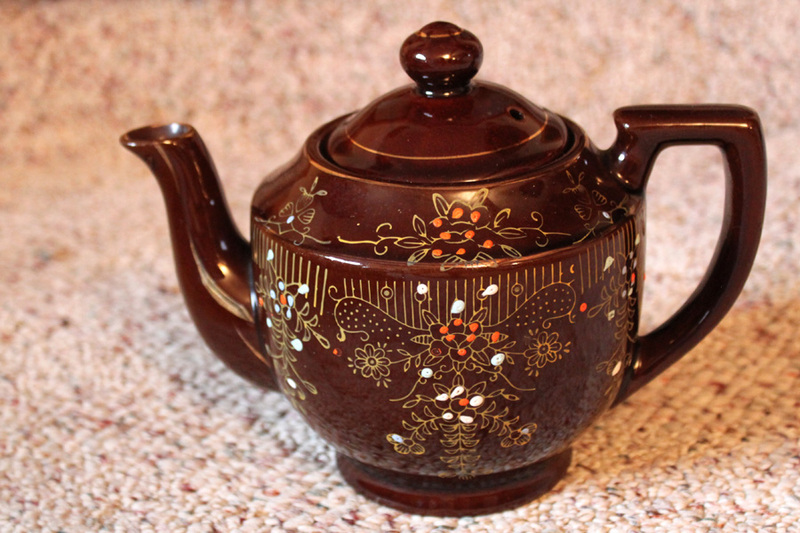 This little teapot is from Japan. I like the intricate design. I had bid on a box with it in and didn’t win. I saw that the woman who won the box picked up a different item and never even looked at her teapot. Later as she walked by me I asked her if she bought the box for the teapot. She didn’t even seem to realize that it was in her box. She said that she didn’t want it. If I wanted it I could have it for a dollar. Yep, snatched out a dollar from my pocket as quick as I could. 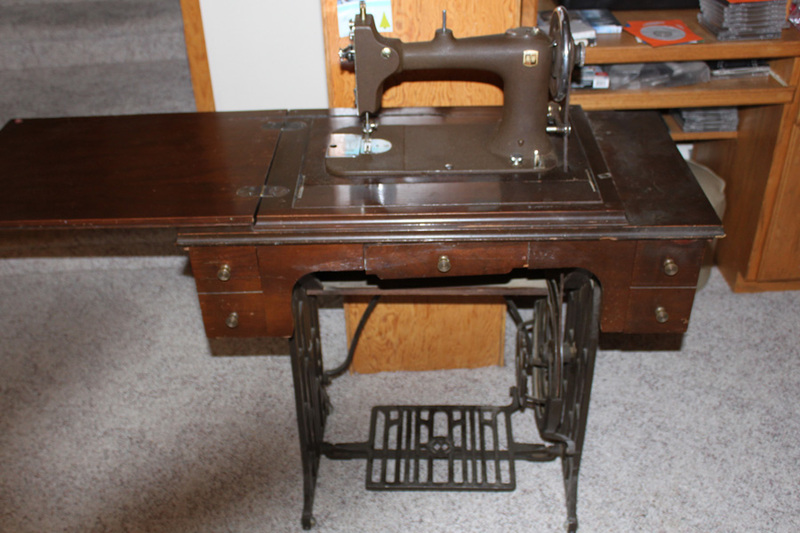 I was able to win this Montgomery Wards Treadle Sewing Machine. It still works even though the belt is wearing thin. It isn’t very ornate. I actually like the simplicity of it. Makes me reflect on the hard times that those that homesteaded in North Dakota had to go through. The final item is this chair, or at least I think it is a chair. As my Mom and I were walking up to a garage sale, I saw it and walked over to it. The lady saw me and said, “take it home for $.25.” What, $.25? I asked her what it was, and she said she thought it was an entry or mudroom chair. The top tray is for putting your keys and change on it. Then you use the seat to sit on while putting on your shoes. However, why is the seat so low? You can’t tell, but the seat is only about 6 inches off the ground. Would you have bought it? 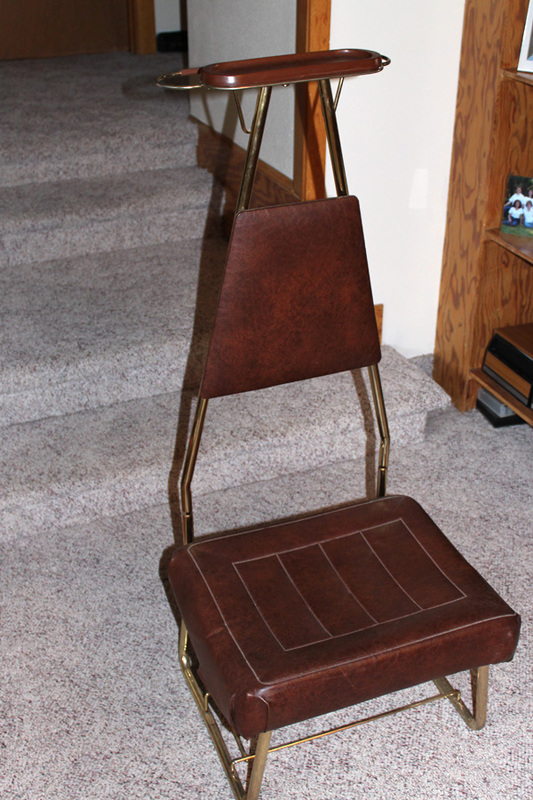 I haven’t decided if I am going to sell it as is or if I am going to spray paint the gold and recover the chair. I haven’t been very successful in reselling my upcycled or redone items locally, and I still haven’t figured out how to ship a large item? If you have sold and shipped a large item, how did you do it? My biggest issue is where to get a large enough box or do the shipping companies box it for you? Any advice would be appreciated. This entry was posted in Auction Finds, Garage Sale Finds by Karen Grosz. Bookmark the permalink. That “chair” makes me think that it is for kneeling and praying…resting your hands on the “tray” part rosary in hand maybe…..i have no frame of reference to base that on, it was just my first thought when I looked at the picture….neat find and a great price! Hmm, I hadn’t thought of that. I will have to try that and see because I really don’t know what it is. Thanks for the idea. Such cool finds! I like how those old tobacco cans look too!